Madrasi is your city guide to Chennai India. From automobiles to education, from latest cars to travel, you will find it here. Look up the Chennai city portal with a difference! Make your money work for you. Learn about popular investment options, mutual funds and other financial matters at Madrasi.info. The Public Provident Fund is a government-backed scheme that is synonymous with tax saving. Any Indian can open a PPF account. The account can either be in his/her name or in the name of a minor. NRIs are also eligible to open PPF account and avail rebate on their income in India. However, subscriptions will be made in their NRO account on non-repatriable basis. Two adults cannot open a joint PPF account. The account has to be opened singly but can have one or more nominations. PPF account can be opened in any Head Post Office, G.P.O. or any selection grade post offices. PPF account can also be opened in any branch of the State Bank of India and its associated banks such as the State Bank of Mysore or Hyderabad and selected branches of other nationalized banks. Wherever the account is opened, a passbook is given in which all subscriptions, interest accruals, withdrawals, loans and other transactions are recorded. 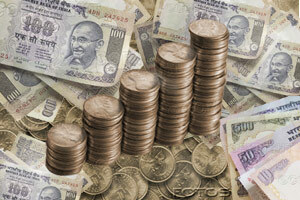 A Public Provident Fund account accords flexibility of investment. It is unlike a bank recurring deposit scheme wherein the same amount has to be deposited every month. One can invest up to a maximum of Rs.60, 000/- per annum in the PPF account and it can go up to Rs.70, 000/- for certain categories of investors. The minimum investment must be Rs.500/- per annum. Investments can also be made in up to twelve installments. PPF offers great return to the discerning investor. The government fixes the rate of interest to be paid periodically. The current rate of interest is 8% which is compounded annually. Because of the tax rebate, the actual return works out to be much higher. The returns are compounded which means an investor can earn interest on the deposits as well as on the interest earned. For example, if a person has put in Rs.60,000/- as deposit in the first year, it will fetch Rs.4800 as interest rate in the first year. In the next year, the interest rate will be computed on 64,800/- as well as whatever the fresh deposit amount is. The normal practice is for the interest to be calculated on the lowest balance in the account between the close of the fifth day and the end of the month. The interest is credited into the account at the end of each year. If an investor puts in a deposit in the first few days of the month, maximum can be derived from the investment as the monthly contributions will earn simple interest till the end of the financial year. Deposits are payable on maturity after fifteen years along with interest at the rates declared by Government from time to time. Deposits on Public Provident Fund account qualify for tax deduction under Section 88 of Income Tax Act. Deposits in this account are also not subject to any attachment under an order or decree of Court. In other words, if the investor is involved in a legal dispute, then a court of law cannot attach or question the money in the PPF account as is the case with other personal property. A PPF account holder can nominate one or more persons. The amount will be paid to the nominee or legal heir before the end of fifteen years in case of death of the account holder. It is normally recommended to open a savings account in the name of the nominee or nominees in the same bank and mention the PPF account number in the opening form. In case of more than one nominee, a joint account may be opened. One need not wait to withdraw from the PPF account if you require from money from it. A loan can be taken on the PPF account from the third financial year excluding the year of deposit. The loan can be equal to if not more than 25 % of the balance in the PPF account. The loan taken from the PPF account can be repaid in a maximum of thirty six installments. The interest on the loan amount is 12 % per year. If the loan or part of it remains unpaid even after thirty six months, then additional interest of 6% per annum will be charged. One can obtain a second loan before the end of the sixth financial year if the first one is fully repaid. If an investor chooses to withdraw the money in the account after the seventh year, then additional loan cannot be taken from the account. The entire credit balance in the Public Provident Fund account is for the investor to withdraw when it matures at the end of fifteen years. Meanwhile an account holder can make withdrawals within specified limits. The first withdrawal can be from the seventh year. Subsequently one can make one withdrawal every year. The amount of withdrawal is limited to 50% of the balance in the account at the end of the fourth year immediately preceding the year in which the amount is to be withdrawn; or the end of the preceding year whichever is lower. For example, if a PPF account was opened in 1992-1993, then the first withdrawal can be made during 1998-1999; the amount will be limited to 50% of the balance as on March 31, 1995 or March 31, 1998, whichever is lower. The rate of interest is fixed by the government from time to time and it keeps changing. Initially the interest was 12% per annum and it dropped to 11%, then 9.5% and is now only 8%. Some investors opine that the stipulated fifteen years lock in period for investment is too lengthy. The Public Provident Fund lacks liquidity and does not afford short term liquidity. PPF also does not provide any avenues for regular income. It provides for accumulation of interest income over a fifteen year period and the lump sum amount with the principal and interest is payable on maturity. PPF account does not have any secondary market and it cannot be traded. Public Provident Fund can be best construed as a retirement planning tool for those who doe not have any structured pension plan covering them. It is money that one will never touch. If a person is just 24 now, he/she will get the money around 40 years of age. This probably can be used to repay a housing loan then.